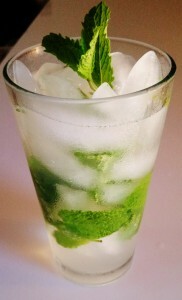 Mojito-Rum,Mint,Lime juice, club soda, Simple syrup. Mojito tip- Use simple syrup. Raw sugar doesn’t mix well. If its not muddled correctly it just sinks to the bottom of the glass. Simple syrup it always your best bet for a perfect mojito.